Cicero Malachi Breland was my maternal great grandfather. This obituary was published on Oct. 4, 1917, in The Era-Leader newspaper in Franklinton, Louisiana. I have not changed any of the spellings; I have reproduced them here exactly as they appeared in the original. Mt. Hermon, La., Sept. 30 — Era-Leader: Mr. Cicero Breeland was found dead in the woods near his home last Monday evening. He had gone to his mailbox in the afternoon and when he did not return the family becoming anxious began to search and found him. He had been dead about an hour. Dr. L.W. Brock was immediately summoned. He hurried to the scene and pronounced his death caused by heart failure. Mr. Breeland was born in Washington Parish in the first ward near the Parish line on the 29th day of January, 1857, was married to Mrs. Fannie Carter, May 30, 1883. He joined the Baptist church when quite young and lived a consistent christian life and was a member of the Pleasant Hill Baptist Church. He had three sons, Robert, Murry and Alvin, who survive him. He was buried last Tuesday in the cemetery by the side of his wife near the home of Mr. I.W. Carter. The funeral rites were conducted by Rev. Early Corkern, and a large crowd of sorrowing relatives and friends were present to pay their last tribute of respect to the departed one. A Friend. This letter was written by my maternal great-great grandfather, John Ticknor Peirce (1846-1912), and includes a mention of my maternal great grandparents, Adolphus Elliot Peirce (1868-1910) and Etta Bailey Peirce (1873-1952). It is part of a Peirce family scrapbook now held by my mother, Gloria Breland Hughes. Her mother, Cora Peirce Breland, was the first child of Adolphus and Etta. Dear Niece it has been a long time since I have heard from any of you. I think it has been about a year since I received your last letter I would be glad you would write again, and let us know how you are all getting on. I wrote to Anna soon after I came home from Florida, but have never heard a word from her. I do not know whether she received it or not. Have you heard from our friend Dr. Alford. I suppose you heard he has married, as he was returning home from Fla he met her on board the cars, and before three days were engaged to be married. I have never seen her but they say She is young beautiful and very intelligent, but I fear he has made a bad choice, as she is always gone, her home was in Kansas City and she stays most of her time there. My oldest Son Adolphus was married last August he married a Miss Bailey. Bedford’s son’s wife died last Jany. How was the orange crop last year, and is there a prospect for a good crop this year. My wife says to ask you how your Turkeys are doing this Spring. She has about thirty young ones. I am through planting my crop we have had a very late Spring and every thing looks bad, Cotton is selling very low here, it is not at all encouraging, there was a poor cotton crop made in this section last year, people expected to get more than they did, but it is still going down. Mary tell Ann, and, Laura to write. I know some of you can write oftener than you do. The girls send their love to you all. I hope you are all well, our children are, some of them complaining, but I think they will be better in a few days. With kindest regards to you and Mr. Holly I remain your affectionate Uncle. 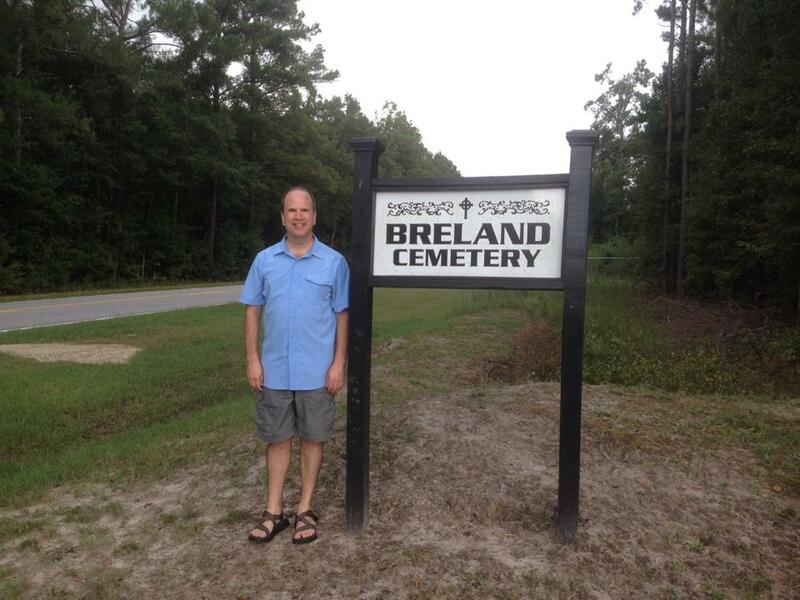 Send your letters to Breland, Tangipahoa Par, La as that office is at my house. In this letter, he wrote his last name as “Peirce.” Some of his descendants now spell the name as “Pierce,” while others have retained the “Peirce” spelling. © Tom Hughes and Hughes’ Views & News, 2018. Unauthorized use and/or duplication of this material without express and written permission from this site’s author and/or owner is strictly prohibited. Excerpts and links may be used, provided that full and clear credit is given to Tom Hughes and Hughes’ Views & News with appropriate and specific direction to the original content. This story was published on page 3 of The West Alabamian newspaper on Wednesday, August 22, 1917. An interesting social event occurred last Wednesday at the residence of Mr. J.H. 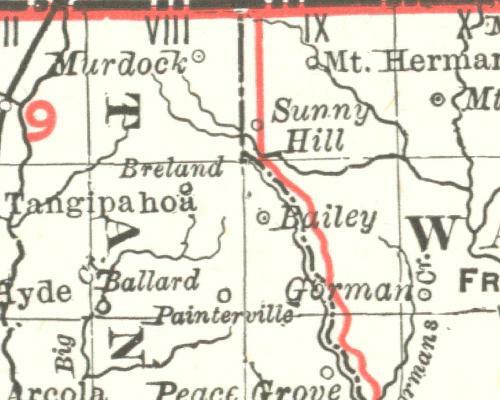 Doughty, three miles north of Reform, in the marriage of his daughter, Miss Virgie, to Mr. Arlie E. Hughes, of Fayette. Mr. Hughes has recently graduated in the law department of the University of Alabama and received an appointment to the officers’ training camp at Fort Oglethorpe. He is a young man of excellent character and attainments. The bride is from one of the best families in the County, and is a young lady of rare accomplishments. The Alabamian, with numerous other friends of the happy couple, extends congratulations. 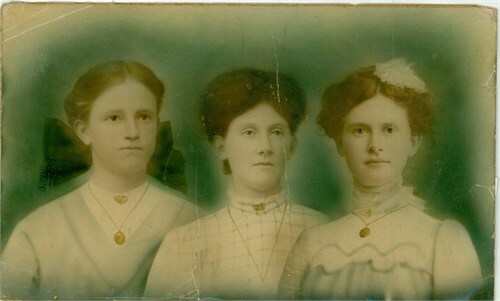 My grandmother and her sisters, from left to right: Virginia Ellen “Virgie” Doughty, 1896-1978; Nannie Mae Doughty, 1885-1921; Annie Lee Doughty, 1882-1964. Photo taken circa 1915. 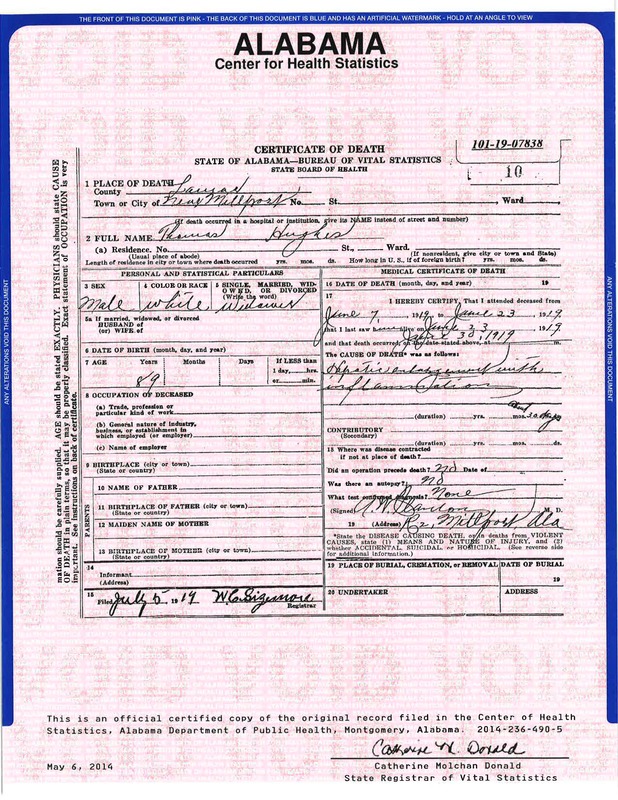 UPDATE (posted Wednesday, Oct. 1, 2014): I am way overdue in posting this, but I am happy to report that the Alabama Department of Public Health has amended this death certificate as I requested. I started my search for my great-great grandfather’s death certificate armed with what I thought was all of the correct information, which I provided on the application form that I sent to the Alabama Department of Public Health. As the form requested, I gave his full name — James Thompson Hughes. I also gave the names of his parents, the dates of his birth and death, and the two Alabama counties where I thought he was likely to have been when he died, Fayette and Pickens. I even included a print out of his Find-A-Grave memorial, which showed that we was buried in the Ashcraft Corner Cemetery in Fayette County, when I mailed in my form and the required $15 payment. After some time had passed, I received a letter saying they had conducted a search of death certificates from Fayette County but were not able to find one that matched the information I had provided. However, I knew at the time there was a death certificate on file reporting that Thomas Hughes, an 89-year-old white, male widower, died near Millport, in Lamar County, Alabama, on June 30, 1919. My great-great grandfather was called “Thomps,” which was an abbreviation of his middle name, and which sounds a lot like “Thomas.” According to his headstone, “Thomps” died on June 29, 1919. And, he was an 89-year-old white, male widower at the time of his death. 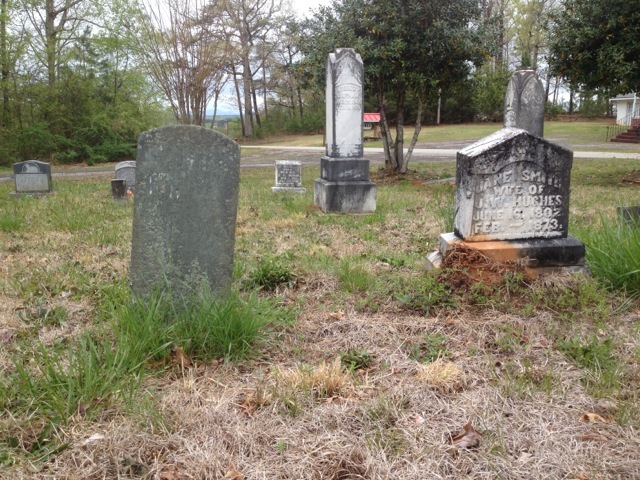 Millport, Alabama is less than 15 miles from the cemetery where Thomps is buried. So, I ordered a copy of the death certificate for Thomas Hughes, which is shown below. I believe this is the death certificate for my great-great grandfather and that his first name was simply recorded incorrectly. Notice that the physician who certified the cause of death was A. W. Clanton. He was Albert William Clanton, and he also happened to be the nephew of Thomps’ first wife, Epsey Clanton. In addition, in 1900 when this Albert W. Clanton was 19 years old, he and his mother lived in a household in Palmetto, in Pickens County, that was headed by Essie Cornelia Dollar Hughes. In 1900 Cornelia, as she was called, was the widow of John B.D. Hughes, who was a son of Thomps and his first wife, Epsey Clanton. All of these factors taken together convince me that the man whose death is recorded on this certificate was not “Thomas Hughes” but was instead my great-great grandfather, Thomps Hughes. I have submitted an official request asking the Alabama Department of Public Health to amend this death certificate accordingly. So far I have not received a reply to that request. What are the take-away lessons for me in this? When doing genealogical research, sometimes you won’t find what you’re looking for if you only search for what you believe to be the “correct” name of your ancestor. In such cases, you need to consider the possibility that your ancestor’s official records, including death certificates, may have been recorded under an alternate spelling of your ancestor’s name, or even under the wrong name. You also need to consider the possibility that the county where your ancestor is buried may not necessarily be the county where your ancestor died. 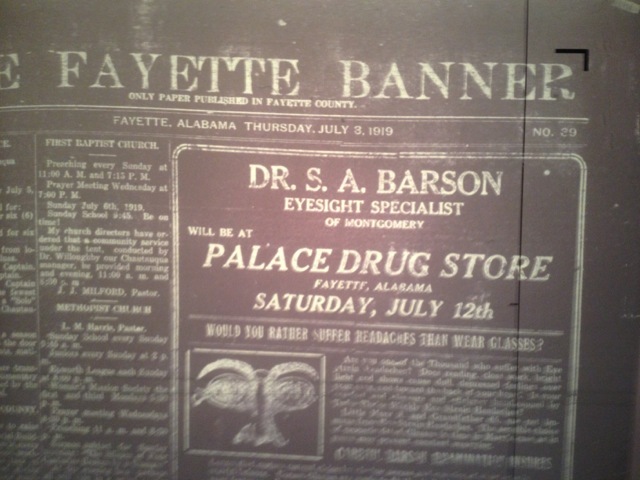 The front page of The Fayette Banner from July 3, 1919 (as viewed on a microfilm reader). This 21-word sentence contains two factual errors. Mr. Thomas Hughes, well known and highly respected citizen of the Ashcraft Corner community, died last Monday, and was buried Tuesday. 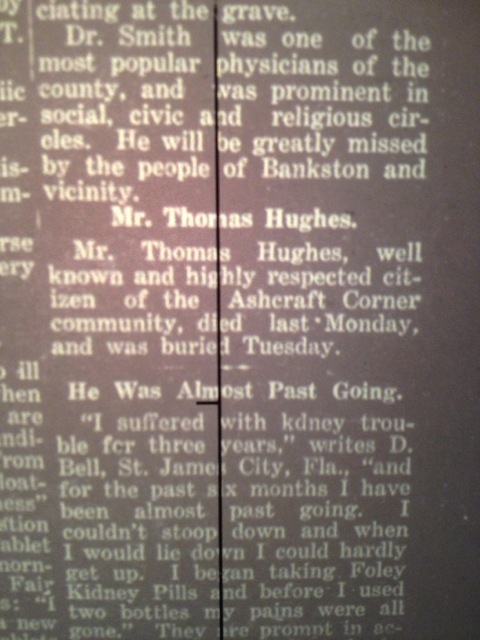 The name of the deceased was given as Thomas Hughes, but I believe this was an error. My great-great grandfather, James Thompson Hughes, was called “Thomps,” which is short for his middle name. “Thomps” and “Thomas” sound a lot alike, especially when “Thomps” is pronounced the way many Southerners would say it — as if it were a two-syllable word. Thomps is buried at the Ashcraft Corner Cemetery in Fayette County, Alabama, and the date of death given on his headstone is June 29, 1919, which was a Sunday. The newspaper gave the day of death as Monday, which would have been June 30, 1919. So, if I am right about this, and if the date of death on Thomps’ headstone is correct — then the newspaper managed to pack two factual errors into just one, 21-word sentence. 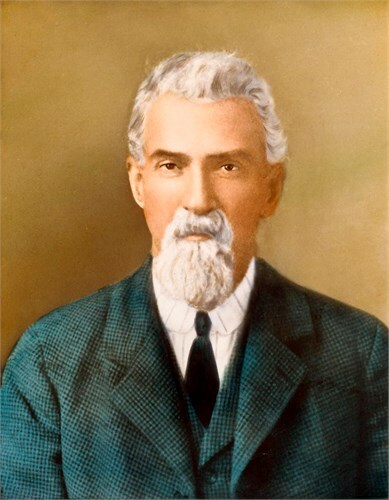 This Larkin Hughes was not a direct line ancestor of mine, but he was a first cousin of my great-great grandfather. This story was published on the front page of The Pickens Sentinel on June 25, 1914. Mr. Larkin Hughes, one of the old and honored citizens of Pickens County, died at his home about 4 miles from Pickens at 3 o’clock Tuesday a.m. He developed a case of pneumonia only last Saturday. 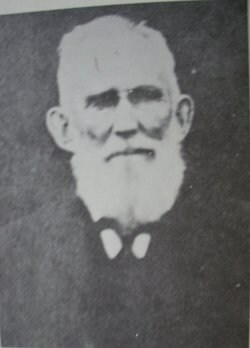 Mr. Hughes was a little over 90 years old at the time of his death and was one of the oldest and best known men in the county. His friends were many and they will be deeply grieved to learn of his death. He was born in Pickens County and served in the Confederate Army and was made a lieutenant during the war. During the war he received a wound in one arm and it gave him trouble until his death. Mr. Hughes was twice married, his second wife and the following children are living: Jas. A., and Alfred Hughes, of Laurens County; Mrs. Charlotte Clayton and Miss Tirzah Hughes of Pickens County, and Mrs. Belle Davis, of Inman. He was a member of Twelve Mile Methodist church and Keowee Lodge No. 179 A.F.M. The funeral was held at Bethlehem church Wednesday and the body was buried with Masonic honors. The Sentinel joins with unnumbered friends in extending to the family sincere sympathy. 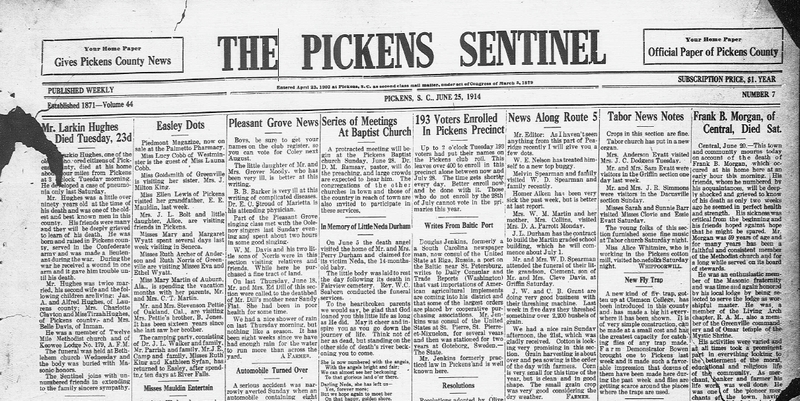 This is a screen shot of the front page from the June 25, 1914 issue of The Pickens Sentinel. 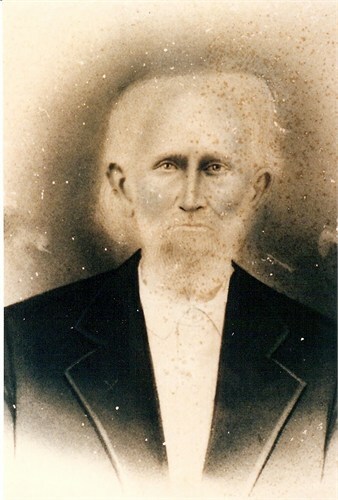 This James W. Hughes was not a direct line ancestor of mine, but he was a brother of my great-great-great grandfather. The obituary below was published in The Pickens Sentinel on July 21, 1881. DEAD – James W. Hughes, died at the residence of his son, Larkin Hughes, four miles South of this place, on Friday, the 15th instant, at 6:30 o’clock p.m. Mr. Hughes was born near Pickensville in this County, on the 31st of day of July, 1798, and was consequently eighty-two years, eleven months and fifteen days old. He lived all his life in this County, except about four years which he spent in Georgia, and reared a family of children here who, together with several grand and great grandchildren, survive him. He had been an earnest devoted and exemplary member of the Methodist Church for sixty years or more, and all who knew him had the utmost confidence in his honesty, patriotism and Christian fidelity. He died full in the faith and much esteemed and beloved by all his circle of acquaintance. His remains were interred in the graveyard at Bethlehem Church, Rev. S.P.H. Elwell preached his furneral, and in an eloquent and feeling manner portrayed the moral worth and many Christian virtues of the deceased. To the sorrowing relatives we extend our heart felt sympathies. This is a screen shot of the obit from The Pickens Sentinel. As I have written about before, I simply cannot say with any certainty at this point, based on the evidence I have in hand, exactly where my 4th great grandfather, Andrew Hughes (1755-1843) is buried. The question of where my 3rd great grandfather, Andrew’s son, Elisha, is buried — is fraught with even more uncertainty. But I can say with great certainty where Andrew’s son, and Elisha’s brother, James W. Hughes (1798-1881) is buried. And, it is that certainty that led me to take my chances on a rainy Saturday and drive more than 2 hours from Charlotte, N.C., down to the countryside outside Pickens, S.C., to see the cemetery where James W. was laid to rest some 133 years ago. Also buried in the same cemetery is a son of James W., named Larkin Hughes. The fact that I am related to James W. and Larkin has been confirmed by the Y-DNA test I did with Family Tree DNA. A descendant of James W. and Larkin showed up as a match for me in the results I got from that test. 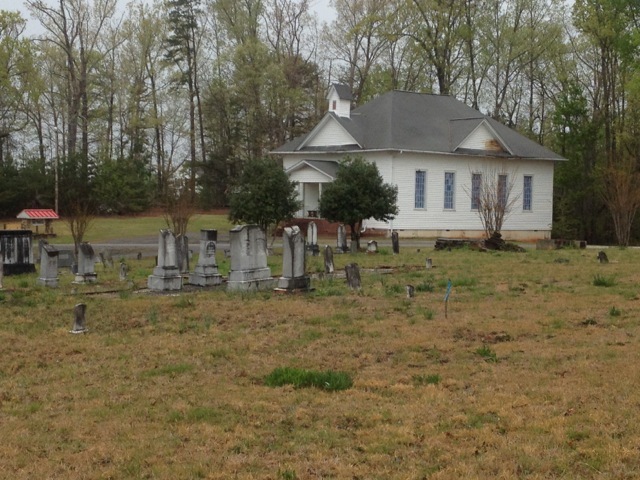 This is Bethlehem Church Cemetery, about 1.5 miles outside Pickens, S.C.
I’ve known about the locations of these graves for some time now. 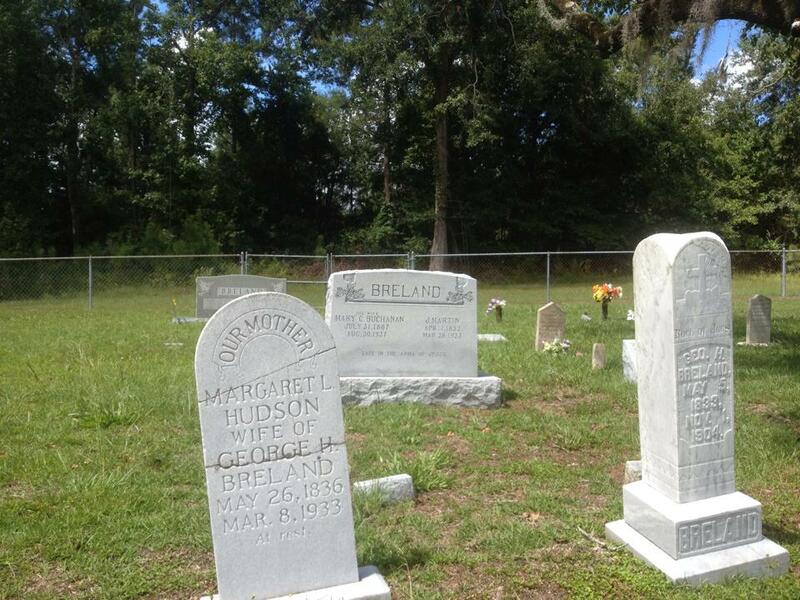 I’ve seen pictures of their headstones on Find-A-Grave and ancestry.com. I’ve viewed the cemetery and its surroundings on Google Earth. But for me, a tremendous amount of value comes from seeing places like this in person that cannot be replicated any other way. After visiting the cemetery, I find myself left with many questions. Why, for example, is James W.’s headstone, which at this point is no longer legible, of such markedly poorer quality than that of his wife, Mary Jane Smith Hughes, who died 8 years before him? Was his family no longer able to afford to pay for a nice headstone by the time he died? The headstone of James W. Hughes is on the left. His wife’s headstone is at right. Did James W. ever meet his nephew, James Thompson “Thomps” Hughes (my great-great grandfather)? 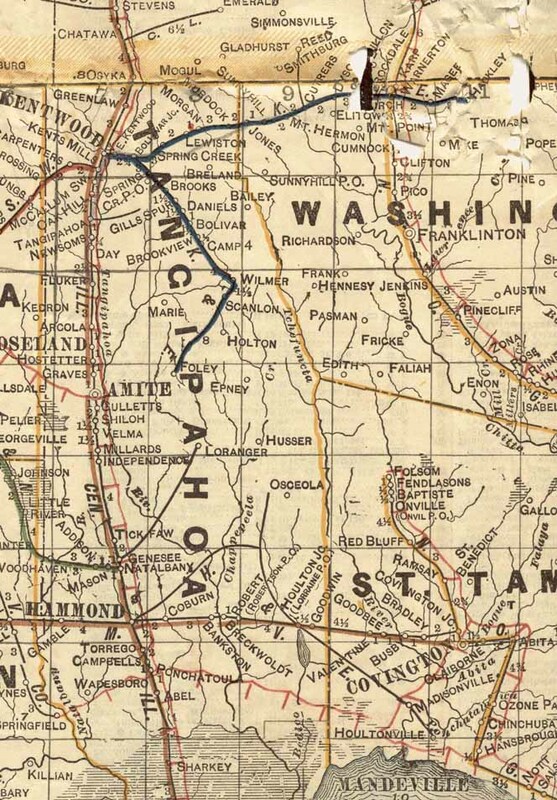 Did he know that Thomps, after being born in Habersham County, Georgia, ultimately settled in “the other Pickens County” (in Alabama) and lived the rest of his life there? And what about Larkin Hughes, who was Thomps’ first cousin — did he ever meet Thomps? Both Larkin and Thomps fought as Confederate soldiers in the Civil War, and both suffered for the rest of their lives as a result of that experience. Were they even aware of each other’s existence? There’s a good chance I may never find the answers to those questions. And, there’s a good chance I’ll never know for sure where my ancestors Andrew Hughes and his son, Elisha, are buried. But, I feel better now after having seen the grave of James W. Hughes in person. Because that may be the closest I’ll ever get to the grave of any of my ancestors from that era.